Railpictures.ca - Michael Berry Photo: After lifting cars at Pointe St-Charles Yard (including intermodal from the Port of Montreal), CN 527 is on its way to Taschereau Yard as it passes over the De Courcelle crossing with a nice lashup of BCOL 4652 & CN 2011 on a sunny evening. | Railpictures.ca – Canadian Railway Photography – photographie ferroviaire Canadienne. 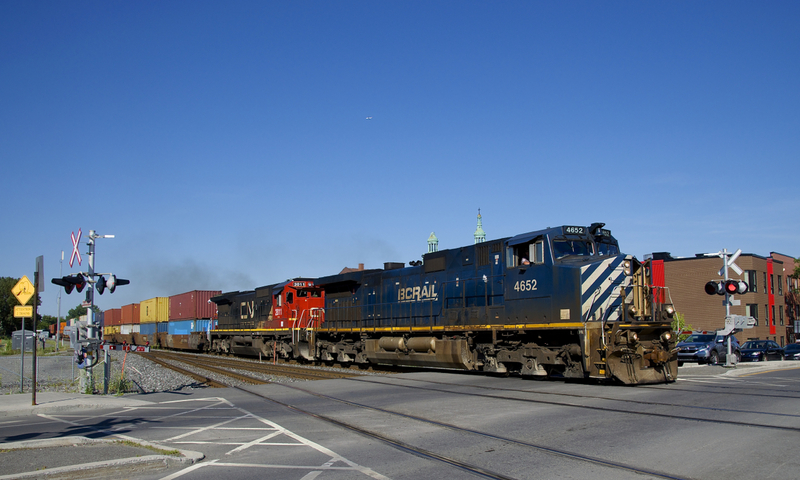 Caption: After lifting cars at Pointe St-Charles Yard (including intermodal from the Port of Montreal), CN 527 is on its way to Taschereau Yard as it passes over the De Courcelle crossing with a nice lashup of BCOL 4652 & CN 2011 on a sunny evening.